With the Thai islands swarmed by millions of European student who read “The Beach,” and with Angkor Wat about as unexplored as Times Square, it can be easy to be a lemming in South East Asia. But you can still experience the backpacker trail of yore — just hop over and start backpacking Myanmar. Myanmar (Burma) is trending as travel destination, owing to the fact that this beautiful country is finally opening up to the world after spending years under an oppressive and reclusive regime. Backpacking Myanmar offers world class archaeological sites, bustling and interesting cities, beautiful hiking, interesting cultural experiences, and gorgeous untouched beaches. And its very picturesque — my photos of Myanmar are still some of my favorites. Unlike elsewhere in Southeast Asia, the locals are not yet accustomed to having tourists around. This means that the people are eager to interact with you and genuinely fascinated by foreigners (you will likely be frequently asked to appear in photos). 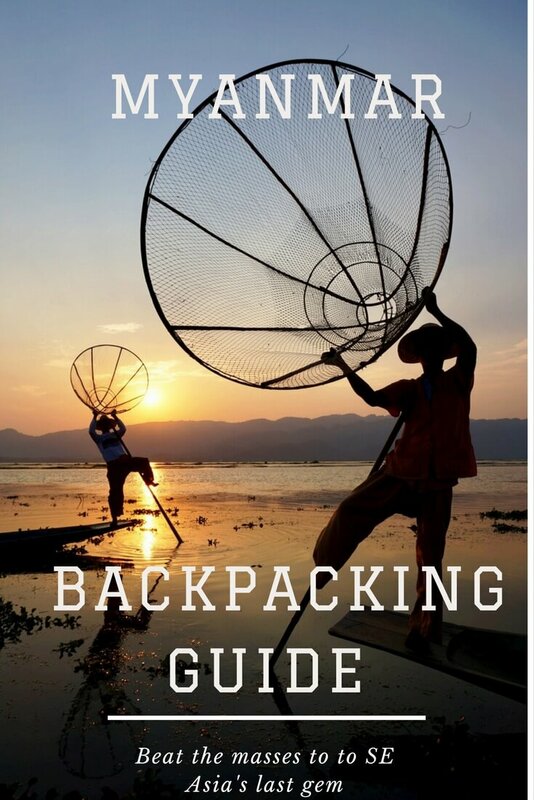 Below I’ve compiled a simple travel guide for your backpacking adventure in Myanmar, with summaries of the top destinations in Myanmar, suggestions on where to stay and what to do, and practical information about travel to Myanmar. 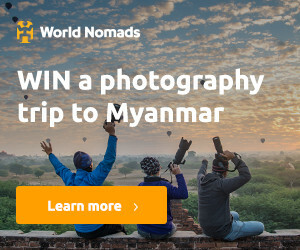 With visa on arrival now available for most nationalities, I suspect that in five years Myanmar will be well entrenched on the SE Asia backpacker circuit. So go now to experience the place before the hordes of tourists descend on the country! This is the main entry point for most international flights (though you can now cross overland from Thailand, most people backpacking Myanmar still fly in). The main attraction here is the Shwedagon pagoda, Myanmar’s top religious site. Entrance is 8000 kyat ($7). Go at sunset for beautiful lighting, and then stay past dusk to see the pagoda lit up. For a unique cultural experience, I highly suggest taking the Yangon Circle Train around the city. A ticket costs less than a dollar. Food and drink vendors pop peddle their wares on the train, farmers use it to transport crops and livestock, and the locals are certain to be fascinated by your presence on their commute. Myanmar’s star attraction, Bagan is a vast expanse of thousands of temples stretching out over kilometers of grassland. These temples represent the remains of the ancient Pagan empire, which dominated the region until it was destroyed by the Mongols. Though the rest of Pagan eroded with time, the stone temples still stand. Each morning hot air balloons fill the skies over the temples. Rides are very pricey (around $325 per person), but just viewing the balloons creates some great photo opportunities. Note that officially the ballooning season ends March 31, but there are a handful of companies that are permitted to run balloons past this date. Also note that, though foreigners cannot drive scooters in Bagan, “e-bikes” are available for rent very cheaply. If you can drive a bike, this provides a convenient way to explore the vast Bagan archaeological zone. Bagan can get very hot during the middle of the day, but is cool at night. The temples look most miraculous at dawn and dusk, so I found that the best way to enjoy them was to rise early for sunrise each day. Once you get too hot and tired, head back to your hotel or hostel (I highly recommend Ostello Bello) for a nap, then head back out at dusk for spectacular sunsets. If you get “templed out,” you can also take a sunset cruise on the river. One day Bagan may well rival Angkor Way on the banana pancake trail. Until then, there is still time to have a temple to yourself for sunrise and sunset. This 100-square kilometer lake is home to fascinating people and stunning terrain. This is a place where the fishermen row with their legs (to keep both hands free) and where the villages are suspended on stilts above the water. Many backpackers coming from Bagan chose to get dropped off in Kalaw, where you can trek for two-to-four days through rice paddies, hills, and villages, ending with spectacular views of Inle Lake. The lake is dotted with a handful of high end resorts, though most budget accommodation is in nearby Nyaung Shwe township. Take a boat tour around the lake, where you can visit markets, pagodas, and monasteries (including one where the monks have trained jumping cats!). Just walk down to the water and you’ll be certain to find a boat willing to take you out. Note that many of the boat drivers will try to take you to many shops along the way (cigars, textiles, etc.). They do this because they get a small commission. If you are like me and prefer to skip these sort of stops, try to negotiate a route without them beforehand. 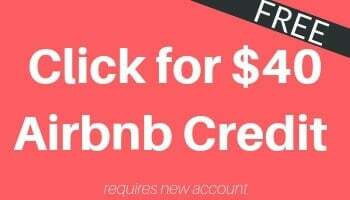 You should be able to get a full day tour for around 15-20 USD. Bike around the lake – You can easily bike around the lake, visiting villages, tofu factories, the winery, and most other destinations along the way. You can’t yet make a full circuit, but it’s easy enough to hire a boat to take you (and your bike) across the lake. Watch sunset or sunrise from a boat – You can get some really spectacular captures of the fishermen this way. They will pose for you, but they’ll not-so-subtly ask for some kyat afterwards…. 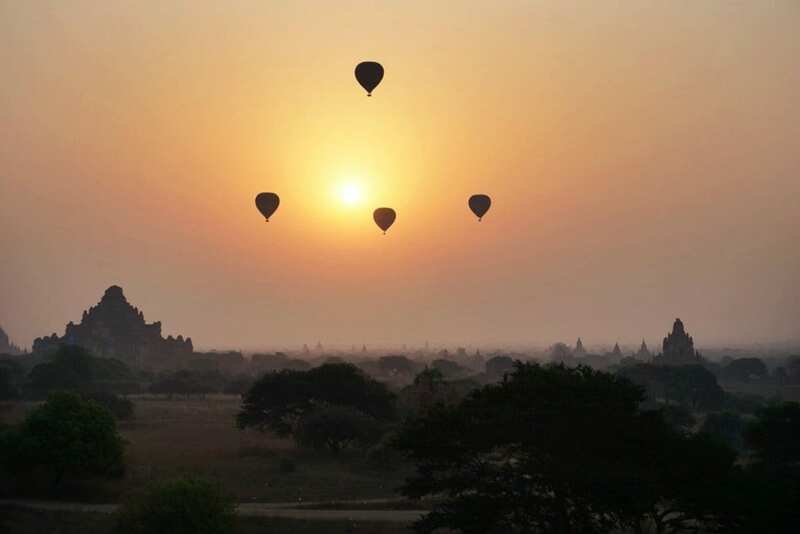 Watch sunrise from a hot air balloon – It’s not cheap (around 300 USD) so we skipped this, but the views are supposed to be arguably better in Bagan and you are likely to have the skies to yourself. Visit the Red Mountain Estate Winery for sunset – Situated on a hill, you can bike there or take a taxi if you plan to imbibe. Though Mandalay admittedly fails to live up to the mysticism famously evoked by Rudyard Kipling, it is still an interesting city to explore for a day. Plus, with cheap AirAsia flights to Bangkok, entering or exiting through Mandalay can save you the trouble of a return trip to Yangon. 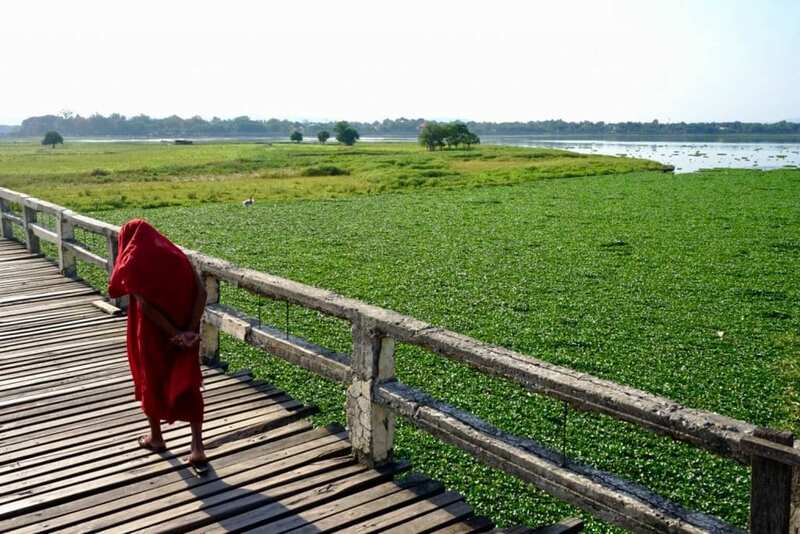 The most popular attraction is the U Bein Bridge, a kilometer-long teak bridge that extends over lily marshes. At dusk the bridge is swamped by people coming to view sunset, but it still makes for a great place for to snap interesting photographs (check out 35 of my favorite Myanmar photos). Besides the bridge, there are numerous temples and monasteries you can visit. Many of these are around famous Mandalay Hill. I’ll always remember as the place where I was urinated on by an infant Burmese child whose parents were eager to shoot a photo with a tall foreigner. Remarkably, even after the kid peed all over me, all the family wanted to do was make sure they still got the shot! Myanmar’s beaches – If you like Thailand‘s coastline but hate the crowds, then backpacking Myanmar might be right for you. Most beaches are still almost completely undeveloped. Mrauk-U – I’ve heard this archaeological zone is like Bagan, only even better. It receives far fewer tourists because it is difficult to reach, but the photos certainly look amazing. Spring for the VIP overnight buses: The best way to get around Myanmar is by taking one of the many bus services that ply the roads between the four main destinations offered above. There are several levels of buses: local buses, minibuses, and “VIP” buses. The VIP overnight buses are $3-5 more expensive but are MUCH more comfortable than the minibuses. Instead of a cramped and hot tiny minibus, you will be treated to a comfortable recliner with power ports and plenty of space to yourself. I had no problem sleeping through the trip when I took the JJ Express VIP overnight bus from Inle to Mandalay. Stay in one of Myanmar’s wonderful hostels – The hostel scene is new to the country, but fortunately the hostels that do exist are really clean and well managed. Plus, because the scene for those backpacking Myanmar is still relatively small, the folks that do travel there are eager to make new friends. 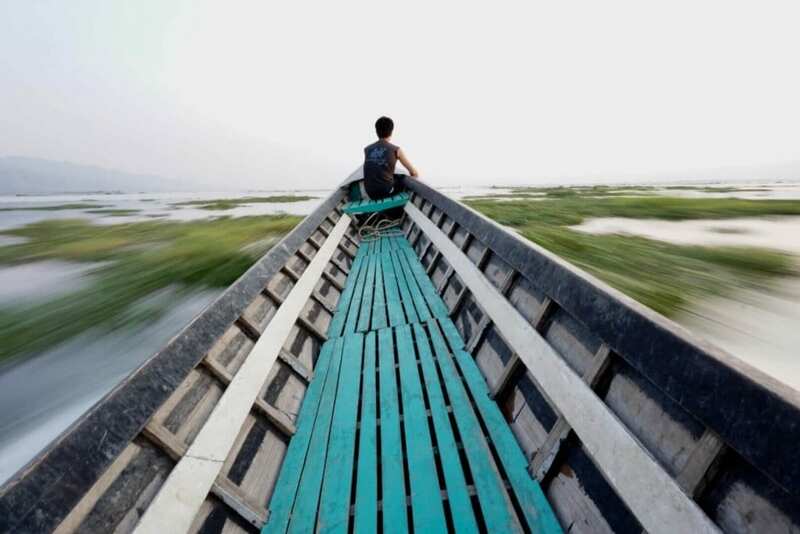 I loved the Ostello Bello hostels in Mandalay, Inle, and Bagan. And in Yangon, I highly recommend Pickled Tea Hostel. 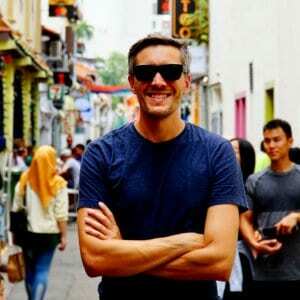 Pay attention to prohibited areas – While I’m a big advocated of getting off the beaten path, be aware that in Myanmar many areas are closed to foreigners. This includes some trekking trails in the north that were previously very popular with people backpacking Myanmar. So be sure to check for the latest information before going. Watch out for Thingyan! – Every spring Myanmar shuts down for almost a week to celebrate its spectacular new year water festival, Thingyan. 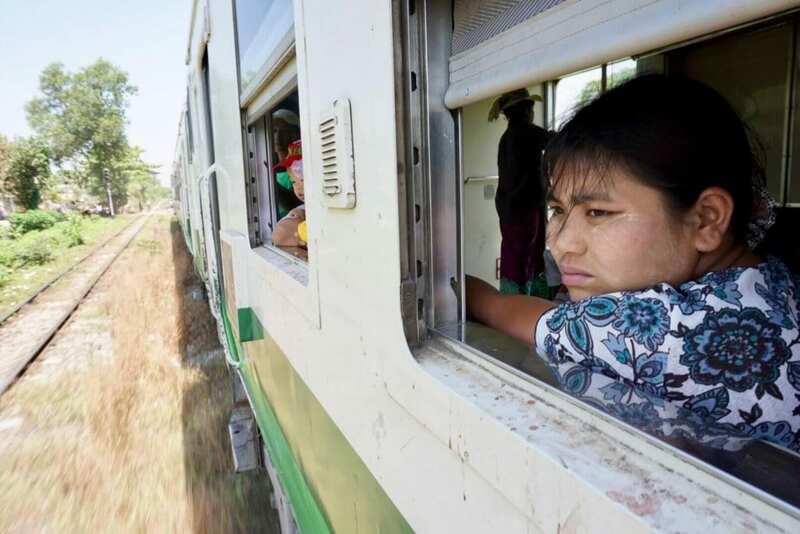 Buses literally stop running during the festival, so if you plan to be backpacking Myanmar in April, be sure to have a solid grasp of your travel plans or you might get stranded. Need a backpack for Myanmar? Check out my review of the Osprey Porter 46L to see why I think it’s the best backpack out there!